The lot number can be found printed on the lower portion of the box label. If you own any of these Lot numbers or have any questions regarding this recall, please call 800-338-1242. Hornady Manufacturing Company will make all arrangements associated with the return and replacement of this product. Any other lot numbers or item numbers are not subject to this recall and require no action. 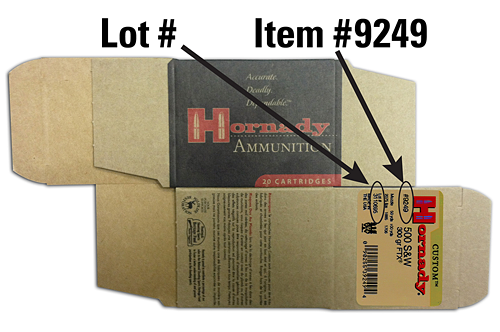 Grand Island, NE – Hornady® Manufacturing announced the recall of seven lots of 500 S&W 300 gr. FTX® Custom™ pistol ammunition. Hornady ballisticians have determined that some cartridges from Lot numbers 3101327, 3110256, 3110683, 3110695, 3110945, 3111388, 3111885, may exhibit excessive chamber pressures. Use of this product may result in firearm damage and/or personal injury. 500 S&W 300 grain FTX® Custom™ Pistol Ammunition. 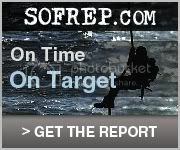 These lots were shipped between September 9, 2010, and October 17, 2011.